Thank you very much. It’s very nice. And thank you to Prime Minister Netanyahu. And I also want to thank Sara for hosting us last night in really a very unforgettable dinner. We had a great time. We talked about a lot of very, very important things. And thank you to Ambassador David Friedman and Mrs. Friedman for joining us, along with a number of very good friends who have come from our country to yours, as we reaffirm the unshakable bond between the United States of America and Israel. Thank you. I’d like to begin my remarks today by sending the thoughts and prayers of the entire American people to the victims of the terrorist attack in Manchester. You know — you’ve all been watching. You’ve seen just a horrible thing going on. I want to send our condolences to the many families who lost their loved ones. Horrific, horrific injuries. Terrible. Dozens of innocent people, beautiful young children savagely murdered in this heinous attack upon humanity. I repeat again that we must drive out the terrorists and the extremists from our midst, obliterate this evil ideology, and protect and defend our citizens and people of the world. Jerusalem is a sacred city. Its beauty, splendor, and heritage are like no other place on Earth. What a heritage. What a heritage. The ties of the Jewish people to this Holy Land are ancient and eternal. They date back thousands of years, including the reign of King David whose star now flies proudly on Israel’s white and blue flag. Israel is a testament to the unbreakable spirit of the Jewish people. From all parts of this great country, one message resounds, and that is the message of hope. Down through the ages, the Jewish people have suffered persecution, oppression, and even those who have sought their destruction. But, through it all, they have endured and, in fact, they have thrived. I stand in awe of the accomplishments of the Jewish people, and I make this promise to you: My administration will always stand with Israel. Thank you very much. My message to that summit was the same message I have for you: We must build a coalition of partners who share the aim of stamping out extremists and violence, and providing our children a peaceful and hopeful future. But a hopeful future for children in the Middle East requires the world to fully recognize the vital role of the State of Israel. And, on behalf of the United States, we pledge to stand by you and defend our shared values so that together we can defeat terrorism and create safety for all of God’s children. But even as we work toward peace, we will build strength to defend our nations. The United States is firmly committed to keep Iran from developing a nuclear weapon and halting their support of terrorists and militias. (Applause.) So we are telling you right now that Iran will not have nuclear weapons. Finally, the United States is proud that Israeli Air Force pilots are flying the incredible, new American F-35 planes. There is nothing in the world like them to defend their nation, and it was wonderful to see these mighty aircraft in the skies over Israel recently as you celebrated the 69th anniversary of Israel’s independence. Thank you. God bless you. God bless the State of Israel. And God bless the United States. Thank you very much. 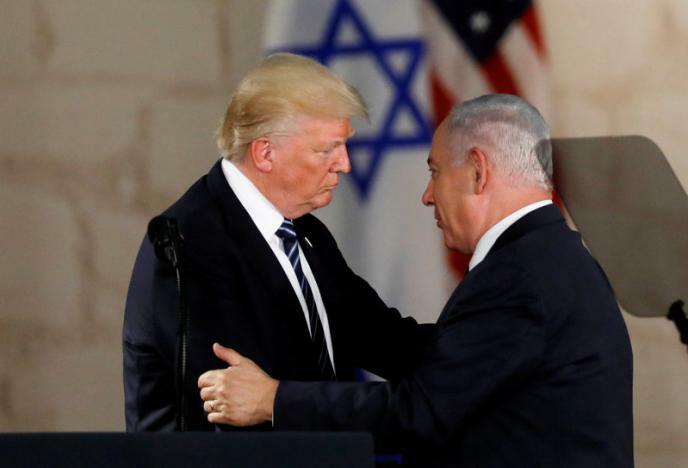 President Donald Trump and Israeli Prime Minister Benjamin Netanyahu, right, arrive for a speech at the Israel Museum, May 23, 2017.